My friend Guy is somewhat obsessed with puns. He would be disappointed if I didn’t at least hint at the fact that this recipe, since it substitutes chicken legs for the traditional veal shanks, is more aptly a Fauxssobucco. This is one of those tried-and-true recipes that assimilates many flavors together gracefully into a hearty, rustic family dinner. This is best served with a fresh loaf of crusty bread or steaming hot polenta. Add all ingredients to a 6-quart slow cooker. 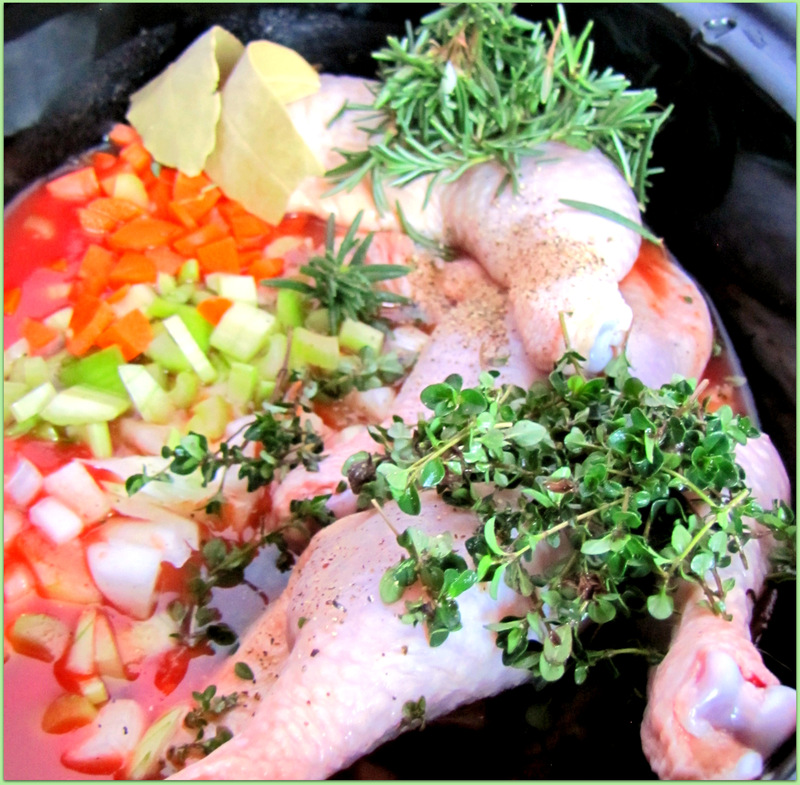 Cover; cook on high until chicken is so tender it falls off of the bone, 6-8 hours. Add water as needed, 1/2 cup at a time as the sauce simmers down. Taste for salt and pepper, adding more as needed. Remove the two bay leaves. At this point, I prefer to leave the large pieces as is in the sauce; however, if serving a larger party, it can be much easier to serve quickly and evenly if the bones are removed and the meat is gently pulled into smaller pieces with two forks. Sprinkle with gremolata (1/4 c. chopped fresh Italian parsley mixed with 1 tsp. grated lemon peel).